Sea to Summit’s astoundingly lightweight and soft Pocket Towel is a fantastic choice for an uber packable quick-drying towel—just make sure you get the right size. There’s no shortage of travel towels on the market and it can be tough to sort through which one is best for you. If you’re the type who would rather sacrifice a t-shirt or let it all air out than pack anything else in your bag, we highly recommend you take a look at the incredibly lightweight and packable Sea to Summit Pocket Towel. Pocket Towel? Could it really be? Well, maybe, depending on the size of your pockets. We opted for the large/bath towel (24 x 48”)—it also comes in small/hand (16 x 32”), medium/dish (20 x 40”) and extra-large/beach (30 x 60”). The large could definitely fit into a larger jacket pocket when stowed away in its case (it packs down to 6 x 3 x 2”), but it’d be a bit of a stretch (pun intended) to cram it into any of your pants pockets—sorry, we’ve already ripped enough pairs of pants to not want to test this theory. The Pocket Towel is described as the lightest, fastest drying and most compact towel in the Sea to Summit towel line. The brand also makes a medium weight Drylite Towel, and an even heavier and more absorbent Tek Towel. Both the Drylite and Tek are a blend of 70% polyester and 30% nylon, as opposed to the 100% polyester microfiber of the Pocket Towel. In typical Pack Hacker fashion, we chose grey over orange, blue, and lime. There’s a bit of a microfiber and, if you look closely, you can see the very finely blended microfiber. A clipped nylon loop is adhered to the corner for easy hanging. Overall, it’s a pretty visually appealing towel (if that matters to you). The vented rectangle case is made of ethylene-vinyl acetate (EVA), a rubber-like and flexible material with a decent amount of give. It has a two-way zipper with nylon cords for easy unzipping on the go. There’s a thin nylon handle on the top you could use to carry it or, better yet, clip a carabiner through if you wanted to hang it outside your pack. 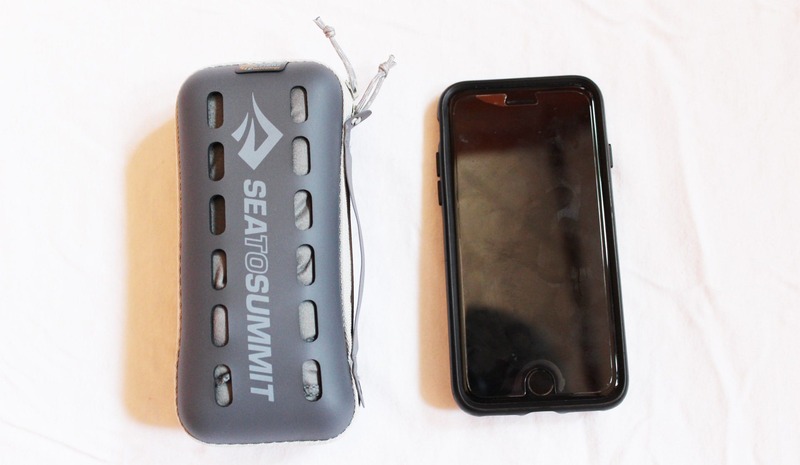 The case is pretty egregiously branded with “Sea to Summit” largely plastered across both sides, and also contains a small tag touting its microfiber technology. The rectangle case is roomy without having an excess of wasted space (if that makes sense). We found it pretty easy to unzip, stuff and go—whether you have time to neatly roll it up or not. The case’s 12 rectangle vents allow a little airflow to combat stank but, they’re pretty small, so you’ll probably still want to air it outside of the case when possible. We found the 3D rectangle shape (Google tells us this is called a “cuboid”) fits in nicely amidst packing cubes. You don’t get the thin and flat fold of mesh carrying bags, but how often do you take the time to perfectly fold up your travel towel anyway? Plus, you could always ditch the case if you prefer to pack it that way. 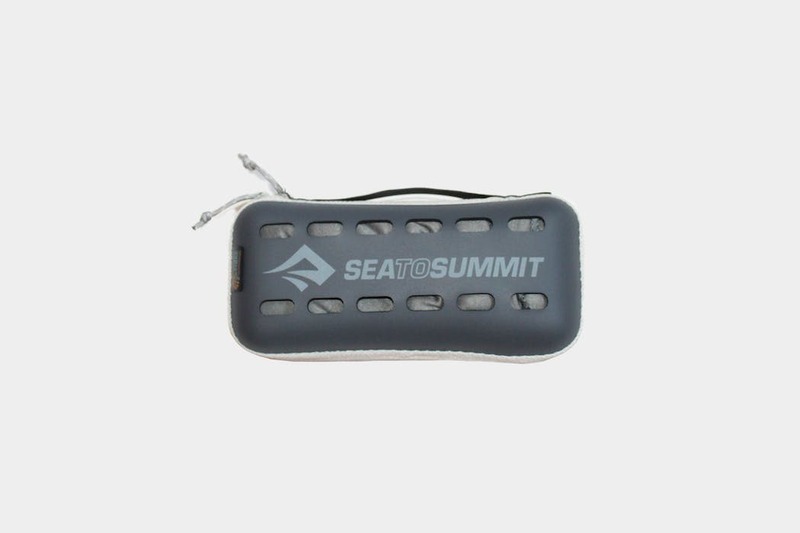 Sea to Summit describes the Pocket Towel as being “whisper light”, which to us just sounds like the name of an off-brand sparkling water. They also say it feels like a “silky scarf”, a simile we can both understand and agree with. We were actually concerned it was too light and too soft upon first contact but, thus far, the Pocket Towel has been both durable and absorbent. It worked like a champ for 10 days without washing—no pilling, no tears, and no lingering stench of Guatemalan river water (we stopped at a waterfall or two). It took quite a bit of water to soak this baby—we ran it under the sink to see how much it could take. The absorbency was definitely impressive for such a small and thin piece of fabric. It’ll dampen with standard use, but won’t get so wet that you can’t dry your entire body. Our only caveat to is, if you plan to use it to conceal any of your unmentionables, you’ll want to opt up to the XL beach towel size. 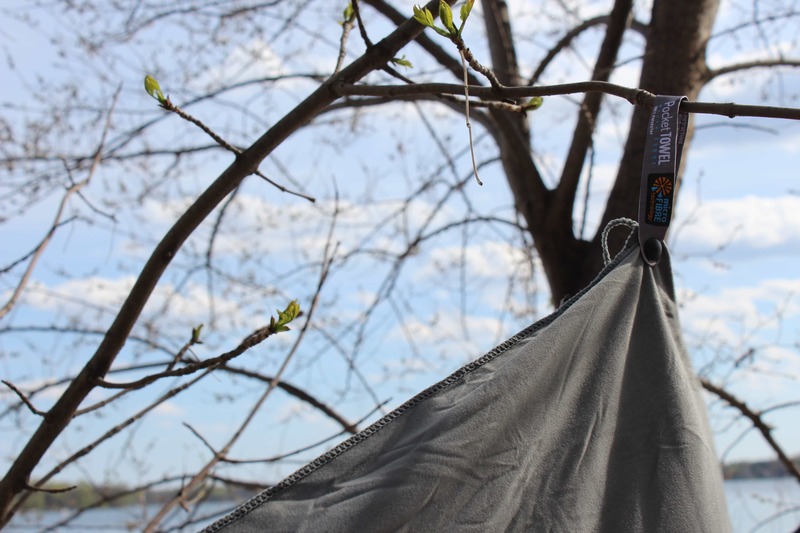 The Pocket Towel will dry your body, but it probably won’t cover it. We also found it tends to adhere a bit to wet skin. The airiness of the nylon microfiber makes for a pretty quick dry, especially if you have the space and time to hang it from the loop. Even in humid Central American temperatures, damp turned to dry in about an hour. After totally soaking it in the sink, it dried out completely in less than six hours. While that’s much quicker than your standard towel, we recognize you won’t always have that time when you’re bouncing from city to city—that’s why its nice that the Pocket Towel rings out easily to avoid dampening anything else in your pack. When it comes to pricing, the Pocket Towel is on par with most higher end travel towels. In comparison to other towels we’ve reviewed, it’s cheaper than the large Matador NanoDry and about the same as the body-sized PackTowl (though that one is notably bigger). All of the towels in Sea to Summit’s arsenal cost relatively the same—meaning you can base your decision on preferred packability and absorbency instead of wallet size. Looks and feels nice, case is easy to use. Concerned it is a bit too thin, but does a great job drying. No pilling yet. Has dried quickly in various temperatures with varying amounts of wetness. If you’ve yet to find a travel towel that suits your minimalist packing needs, you should definitely take a look at Sea to Summit’s Pocket Towel. It’s surprisingly absorbent and durable for a towel this lightweight, quick-drying and silky smooth. The large/body size will get the job done but, if you can spare a few extra inches, you’ll probably want to size up to the more conservative beach towel size. Caroline works daily in the travel and tourism industry for the great city of Saint Paul, Minnesota. She’s fluent in social media, sarcasm and road rage. 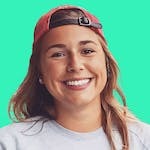 Caroline’s favorite travel destination is Lake Como, Italy (mostly because she misses Minnesota’s lakes whenever she leaves the state).